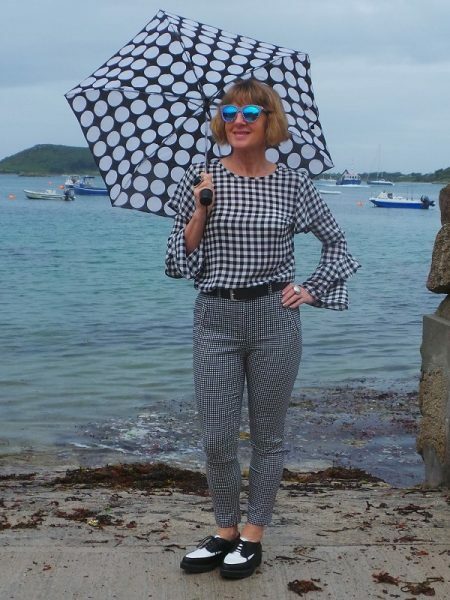 5 Over 50 is a monthly ‘outfit challenge’ consisting of 5 ladies all over 50 plus one new theme every month, this adds up to five very different outfit interpretations. Monochromatic means using only one colour, not to be confused with monochrome which means two tones. You may have heard this trend referred to as ‘Tonal Dressing’. Think of Barbara Cartland who only ever dressed in ‘Cartland Pink’ a coral-hued shade she wore head-to-toe, lips included! What a woman – I loved her. Whilst this theme has endless possibilities and at first glance appeared easy, I had a difficult time deciding which hue to choose and in what tones. Eventually I came up with three! 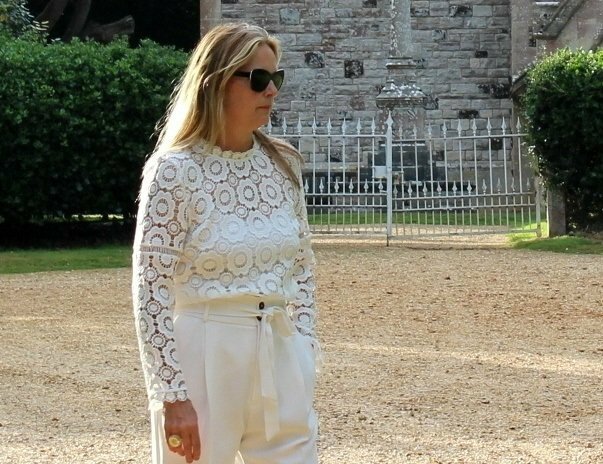 For my first monochromatic outfit I choose to wear a lace blouse from JD Williams’ spring collection and some cream high waisted trousers from Mango. Shoes are from Radley and are a few years old, but I love them and because they are good quality they are wearing very well. I have fallen for yellow in a big way this year, it is everywhere! I have to admit, I am actually writing this from Florida (I am visiting my Mum who lives here) but managed to photographed 3 outfits whilst I was still at home in Dorset last week! This week whilst shopping in the Mall with my Mum I bought some shorts and a pretty top also in a pastel yellow and persuaded my darling Mum to help photograph me. I then bravely donned some shorts for the challenge! 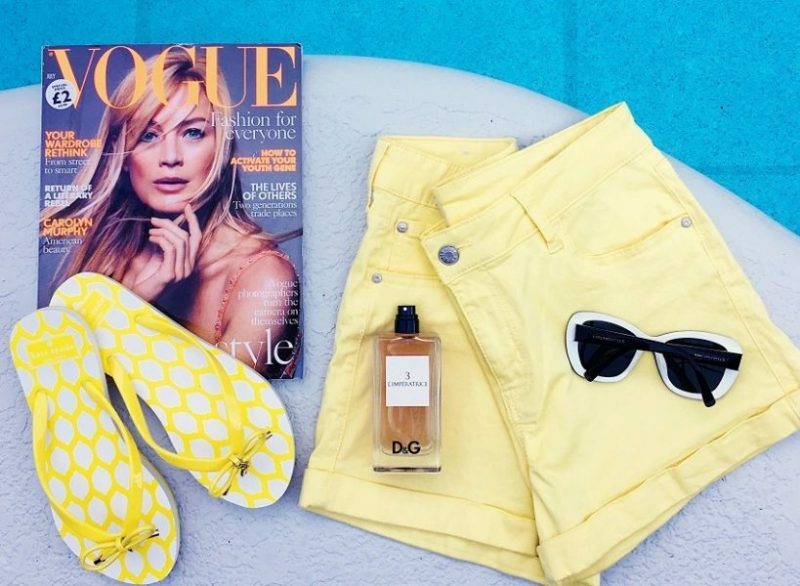 Are you loving yellow this year too? Shorts and t-shirt were both from TJ maxx (TK Maxx in the uk) but the bargain of the week has to be my yellow Kate Spade flip flops, they were approx £17 ! Well yes I do know black is a classic that never goes away, but it does fall out of favour every now and then. 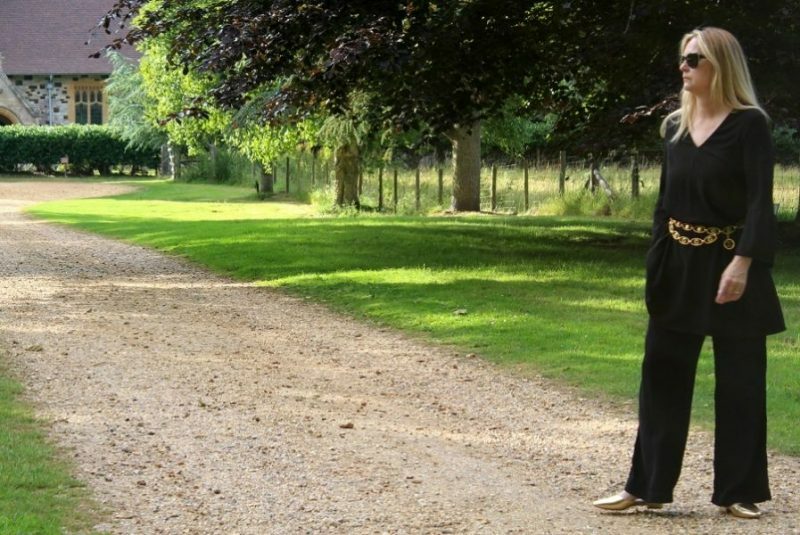 However, I still rely on black whenever a formal outfit is called for, don’t you? Both the trousers and tunic top I have had for a long time. Sometimes I wear the top as a dress and sometimes belted as a blouse. My gold flat sliders/mules are from Mango and my Chanel gold chain belt, I have had for over 25 years! Please pop over to their blogs, say ‘Hi’ from me and have a look at their different interpretations of our monochromatic theme. Last but not least is Gail, who actually had the idea for this marvellous 5 over 50 challenge. See more on her blog Is this Mutton. This pretty picture was taken in Greece whilst she was on holiday. Have you seen the May and June challenges? Previous Post Titan Joseph Joseph Trash Can Compactor or Transformer? Next Post Travel Essentials for a long haul flight, 5 to pack. Thank you yes i am loving all the yellows this year! Love ’em all! They bounce between simple elegance, playfulness and pure sophistication. What is there not to like about that range?! Well done on the work put into the challenge. So pleased you like my choices! thanks for your comment too. I very much appreciate it! Hello and thank you, it is a nice idea and very easy if you have a fave colour that you buy all the time! You on the other hand clearly revel in monchromatic styling. 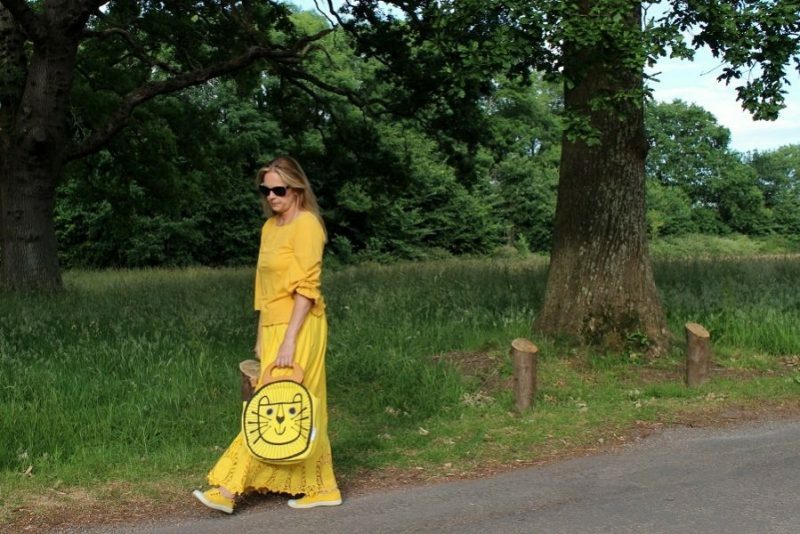 The love all the yellow which is a perfect way to conjure up the sun on a British summer’s day. Ha ! Anna I must admit I had to look it up as I kept getting confused too……please dont worry you look fabulous as usual! Glad you approve! I love your link up? 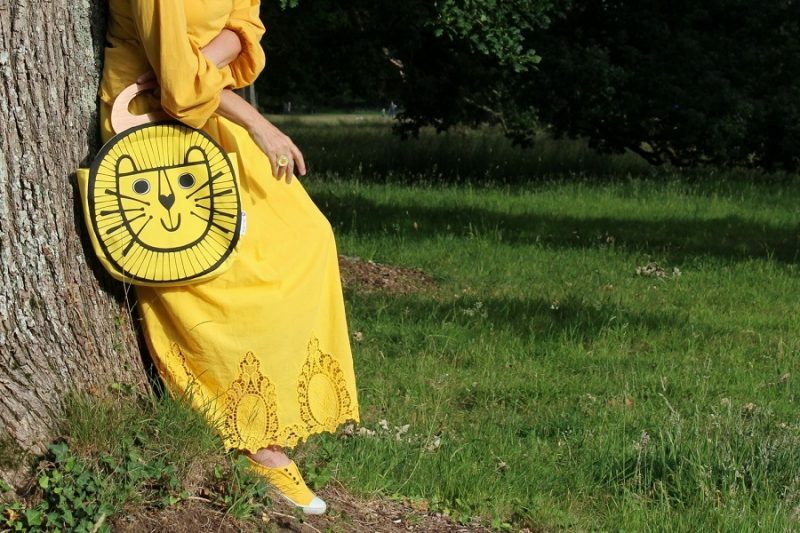 Three great looks Ashley – the knitting bag with the yellow maxi skirt is inspired!! Looking forward to your challenge next month! Sharon thank you! I think you may be my biggest fan!! Hhaaa thanks Barb! popping over to you now!